An excellent Freeview HD user interface and great handling of digital files from a USB stick are the highlights, though the provision of just two HDMI slots and a single USB convince us that the UE42F5000 isn't the great-value cheap TV it could have been. We make no apologies for discussing the latest and greatest 4k and OLED TVs, but we're keenly aware of how wide the appeal is of a good-value 42-inch telly – and that's precisely what this Samsung is all about. With an RRP of £559.99, but selling widely for a touch under £400 online – and even spotted on some websites for £369 at the time of writing – Samsung's 42-inch UE42F5000 is at the sweetest spot in terms of price, but it's not got the latest in smart TV apps. Despite the no-show for Samsung's awesome Smart Hub user interface, that builds-in the best collection of catch-up TV apps in the UK, as well as a lack of Wi-Fi, the UE42F5000 seems poised to appeal to those who couldn't give a fig for smart TV. 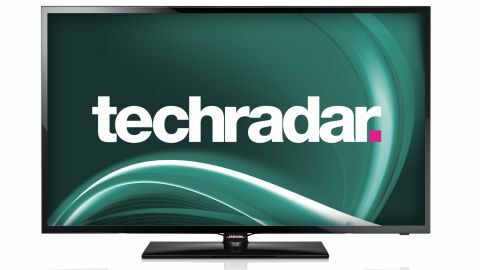 It's likely owners of third-party set-top boxes are after a simple, good value and slim-looking LED-backlit telly with Full HD, and Freeview HD purely as a back-up. This TV seeks to fulfil that simple desire. Built around an LCD panel backlit by LEDs, the UE42F5000 boasts a Full HD resolution and Samsung's HyperReal picture engine, the chief wizardry inside that being Wide Colour Enhancer Plus circuitry. It's hardly Samsung's best-looking TV, but with a slim gloss black design and a bezel that measures a mere 18mm wide, it looks good from afar. The 49.4mm depth compares well to a similarly-sized plasma TV and gives a decent side-on view, too, and only those getting close enough to touch the UE42F5000 will notice its rather plasticky, lightweight feel that just doesn't feel substantial enough for a telly – but that will make wall-hanging a cinch. Meanwhile, the optional screw-on desktop stand is rectangular and non-offensive. Sound is dealt with by a couple of 10W amplifiers, though in such a slim chassis we're not expecting audio fireworks. Despite the UE42F5000's expected appeal to Sky, BT and Virgin box owners, it's become essential to fit all UK TVs with a Freeview HD tuner by default. That's exactly what the UE42F5000 has, guaranteeing 50+ channels. Add some basic support for digital music, video and photos via USB, and for UK living rooms needing a great-value solution, the no-frills UE42F5000 looks – on paper – a competitive candidate. The UE42F5000 is among the most basic sets in Samsung's 5 Series. As well as the bigger 46-inch Samsung UE46F5000 (£700), the F5000 range also includes the 22-inch UE22F5000 (£230), 32-inch UE32F5000 (£269) and 39-inch UE39F5000 (£510), all of which lack Smart Hub and Wi-Fi. The step-up – and slightly costlier – variant F5500 Series adds an extra slot apiece for both HDMI and USB, as well as Wi-Fi and Smart Hub apps, and can be bought in the same sizes: the 32-inch Samsung UE32F5500 (£480), 39-inch Samsung UE39F5500 (£600), 42-inch Samsung UE42F5500 (£650) and 46-inch Samsung UE46F5500 (£850). The 50-inch Samsung UE50F5500 (£1,030) is also available.